Cole slaw is one of those foods that comes in a dozen different varieties. It can be sweet or dill, mayo or vinegar based, with or without added vegetables. This is a recipe given to me by a friend and is one of our favorites. Melt the butter in a skillet. 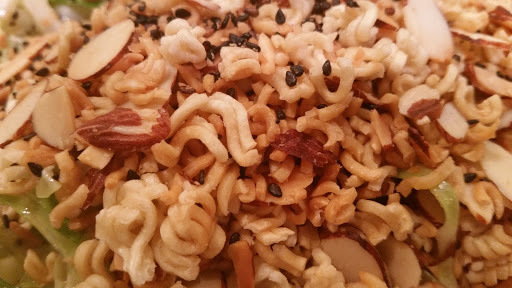 Add the Ramen noodles, nuts, and seeds, and brown. Strain onto a paper towel and let cool. 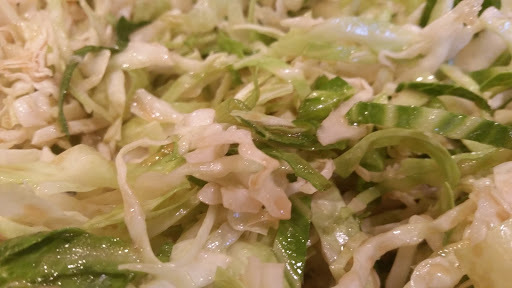 Mix the shredded cabbage with the sliced onions in a large bowl. I didn’t have red cabbage on hand so I omitted it this time. Whisk the sugar, vegetable oil, and soy sauce until thoroughly mixed. (Putting everything into a jar with a tight fitting lid and shaking vigorously works really well.) Pour the dressing over the cabbage mixture and toss well. Just prior to serving, add the Ramen mixture. If you add this sooner it becomes soggy…blehh. This is a great recipe to carry on picnics since it doesn’t have mayo in it.